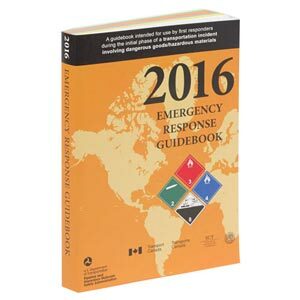 The Pipeline and Hazardous Material Safety Administration (PHMSA) has published a request for information for the 2020 Emergency Response Guidebook (2020 ERG). PHMSA is requesting comments and input on ways to improve the ERG as they develop the 2020 ERG. Does the ERG effectively emphasize the most useful information for the initial response phase? Are there ways to improve the White Pages? How could PHMSA change/improve the introduction and description of the Green Pages, or any of the tables? PHMSA has established an e-mail address for interested persons to submit their input. Comments should be submitted to: ERGComments@dot.gov. This article was written by Thomas Ziebell of J. J. Keller & Associates, Inc.
J. J. Keller's 2016 Emergency Response Guidebook (ERG) helps satisfy DOT's requirement that hazmat shipments be accompanied by emergency response info.